I intend to keep blogging from Chicago, even if the entries are short. There’ll be plenty to write about while we’re there. Weather’s supposed to be chilly but nice, and I’m looking forward to seeing my family and the usual cast of convention characters. In other news, I started the process today to get a bunch more of Sofawolf’s books up on Amazon, including New Fables and “Common and Precious.” A lot of people had asked when C&P would be available there, and the answer now is “in a week or two.” When the listing does come up, I will make another announcement here, and if you read and liked the book, please go to Amazon and leave a review. The more feedback, the better. Maybe once it’s up, I’ll get a short or two from that world up on Amazon shorts. I owe them a story–although Jeff has been talking about doing another New Tibet anthology, and of course I want to write the “Graveyard Shift” novel (a sort of prequel to “Common and Precious”). But those projects are a year or more out–and believe me, that’s as frustrating for me as it is for you. San Diego Comic-Con International is quite the event now, making national headlines and attracting Hollywood and its satellite industries (now including video game producers and toy companies). 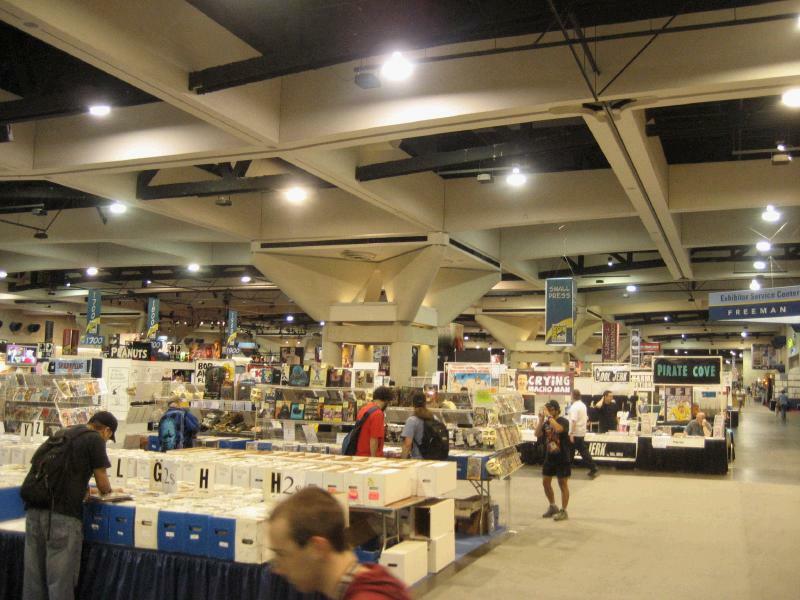 I love comics, and my favorite part of Comic-Con (apart from all the restaurants in San Diego) is walking around the independent publishers and small press tables to see what the individual creative spirits are up to this year. This also awakens in me a yearly desire to Do A Comic, mainly because any story without a graphical component is largely ignored here. That desire gets worse when you spend the entire weekend sitting behind a table watching your novel be ignored while people coo over some (admittedly very good) graphic novels. At any rate, I’ve had a comic idea in mind for, oh, years now, and though I can’t draw quickly or all that well, I can draw passably and in the past week I’ve fleshed out the world and plot of this comic considerably (in past years it had never really gotten beyond the layout for page 1, followed by “and then some stuff happens”). So we’ll see how it goes–I will update more in this space as time goes on. Speaking of projects that don’t require me to draw, though, my literary journal New Fables is now on sale online from Sofawolf. This project grew out of a Fabulist Fiction class I took at Stanford, when some friends and I realized that “furry” stories with literary merit could be classified as fabulist, and when our classmates in that class really enjoyed our stories without questioning too much why they all involved talking animal people. Neither of those stories are in this anthology, but in addition to my own contribution (which is set in a future Earth in between our time and the time of New Tibet, intended to be in the same world though nothing really establishes that), there are stories by Michael Payne, Kevin Frane (my former classmate), and Ryan Campbell. In addition, Phil Geusz and I wrote essays; Ryan, David Cowan, and Elizabeth Barrette contributed poems; and Sara Palmer and Heather Bruton added one-page illustrated stories. Ursula Husted drew a lovely cover for us, and the ever-talented Blotch and Jill C. also helped with interior illustrations. I’m really proud of it. Please go check it out! My novel “Common and Precious” is now for sale on Sofawolf Press’s site. It debuted last month at a local convention where we sold out of the box we brought. Initial reaction to the book has been positive enough to make me happy. Here’s hoping people continue to enjoy it! Link will remain over in the right sidebar for now. “Life Is Beautiful,” one of the stories from the “Shadows In Snow” anthology, is now for sale as an Amazon Short. If you’ve already got the collection, no need to buy this one. I cleaned up a couple minor things, but it is largely the same as the version in the book. The Amazon Shorts folks decided to open up the program to previously published works, and since SIS is also being sold on Amazon, they thought it would make for some nice cross-linking. The Amazon Shorts people, on the whole, have been extremely helpful. Phil Geusz, a friend of mine who also writes, has also found their program to be a good outlet for short fiction, and they have a bunch of stuff there by more famous authors. I’m not sure how to judge whether the program is a success, but if you judge by the catalog alone, they’re doing great, and I hope to see their program continue. The venue is much appreciated for smaller-name authors like Phil and myself, because most people will happily spend four bits for a story, and with Amazon’s delivery mechanism and trust behind it, it’s nearly effortless for the author and reader both. At any rate, the link will be in the sidebar sometime soon. I need to send them something unpublished next. And a very Merry Christmas (belatedly) to you and yours. Here’s hoping for wonderful things in 2007.